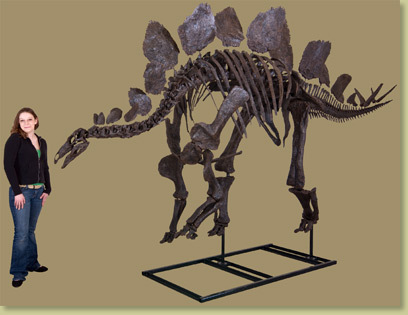 SARAH Stegosaurus is an excellent specimen. Ranking among the top three ever found, it has a very complete skull and skeleton and is the most complete found of this species. SARAH is a Dinosaur Safari Inc. specimen, discovered on the Red Canyon Ranch near Shell, Wyoming by Bob Simon. Siber+Siber together with Sauriermuseum Aathal, excavated and prepared the original bones. BHI produces this amazing replica using molds it created from the original. No Jurassic scene is complete without a Stegosaur skeleton. Displayed together with Allosaurus BIG AL TWO, your visitors will be transported to a time when predator and prey were fierce, elegant and breathtaking. Notes May take approximately six months for production. Check with us to see if an earlier delivery is possible.